Alaska Gov. Sarah Palin says she’d come out ahead if she went one-on-one with fellow jogger President Barack Obama in a long run, according to an interview published online Tuesday. Ha ha. NY Times, you made me click this article. I actually doubt that Palin could beat Obama in a long run, but her chances are much better than trying to beat Obama in a Presidential run. Since 2004, 18 states and New York City have approved laws that make manufacturers responsible for recycling electronics, and similar statutes were introduced in 13 other states this year. The laws are intended to prevent a torrent of toxic and outdated electronic equipment — television sets, computers, monitors, printers, fax machines — from ending up in landfills where they can leach chemicals into groundwater and potentially pose a danger to public health. “If you make it easy, they will recycle their stuff,” said Barbara Kyle, national coordinator of the Electronics TakeBack Coalition, a nonprofit group based in San Francisco. If products are recycled rather then dumped, parts of the machines are refurbished for new use where possible; if not, they are disassembled, their glass and precious metals are recycled, and the plastics, which have no reuse market, are often shipped overseas to developing countries for disposal. So, “green” means disposing the most toxic parts of the computer in overseas developing countries. You know that they’re just burning it or tossing it into a landfill over there. We’re stripping the electronics of all the valuable and easy to recycle parts and sending the most toxic parts off for others to deal with. I guess it beats throwing it straight in the trash. A man who was one of former Senator John Edwards’s closest aides has a deal to write a book claiming that Mr. Edwards said he “would be taken care of for life” in return for falsely claiming he was the father of the baby carried by Mr. Edwards’s mistress, Rielle Hunter. The aide, Andrew Young, sold his book proposal to St. Martin’s Press for an undisclosed price late last week. In his proposal, Mr. Young quotes Mr. Edwards, a Democrat who was his party’s vice-presidential nominee in 2004 and ran for president last year, as begging him to confess to fathering Ms. Hunter’s baby. Did anyone actually believe that Andrew Young was the father of the baby? As soon as the story came out it seemed preposterous. So, John Edwards was having an affair with a woman, but the father of the baby is actually one of his closest aides? Pretty pathetic attempt at a cover-up. CNN report on the prisoners in the Philippines creating their new tribute to Michael Jackson. Look what you can do when you’re “forced to dance four hours a day”. Philippines prisoners performing “We are the World”. Are there really 10 movies worth a Best-Picture Nomination every year? I think five was a pretty reasonable number and even then, it usually comes down to a couple films anyways. This just serves to devalue what being nominated means. Be thankful that we still have the Union Terminal in Cincinnati. This article is about 11 train stations that weren’t so lucky. Here’s a video of former mayor of Cincinnati Jerry Springer in the 70’s singing a song to save Union Terminal. UPDATE: January 16, 2010. It’s time for my annual renewal of MobileMe. Instead of renewing MobileMe for $99, I purchased MobileMe Individual (Updated 2009 Version) at Amazon for $72.49 with free shipping. If you’re interested in signing up for MobileMe to use the iPhone’s new Find my iPhone feature, buy it from Amazon and save money. from Amazon for $67.89! 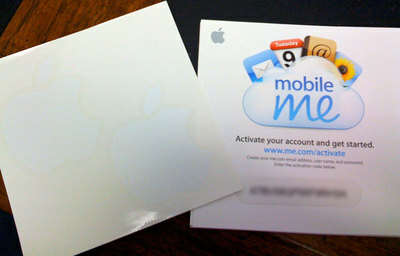 What you get in the MobileMe package is a code for MobileMe as shown in the picture below. This is for both new users AND renewals. Buying MobileMe from Amazon is like getting a $31.11 coupon off MobileMe! is slightly cheaper- $116.50 and since it’s just a code, it should work exactly the same. Here are some quick impressions after using my iPhone 3GS this past weekend. The iPhone 3GS is a lot faster than my first generation iPhone. Surfing on WiFi is nearly as fast as surfing on my computer. 3G is definitely better than EDGE and I’m greatful for that, but it’s still kind of slow. I hear that the iPhone 3GS has better battery life. Maybe it’s because I’m using the iPhone so much, I’m not really seeing it. I’m pretty much looking for my battery charger by the early evening. The speakers are way louder than my first generation iPhone. Finally, I can hear my ringtones. Maybe it’s the 3G, but my first generation iPhone would cause my speakers to buzz if the phone was placed to closely to my computer. The 3GS doesn’t seem to have the same GSM interference problem. The video camera was the feature that I used the most. While the video quality isn’t as great as my HD video camera, it’s quite good. And the fact that it’s part of my phone means that I’ll be able to capture more moments as I always have my phone with me. Daylight video is very good, but low light video captured in a restaurant was pretty dark. Image stabilization would be a useful feature as it’s hard to keep the iPhone completely steady while shooting videos. But, iMovie’s image stabilization should be able to smooth it out. I shot most of my video with the camera held in the upright position. When imported into iMovie, the clips were shown sideways in the preview window. I haven’t figured out how to rotate the video without cropping it. I think it’s probably better to just shoot video with the iPhone turned on its side. The camera’s touch focusing worked really well. Mostly, it improved the light balance of the photos by sampling the object that you’re taking pictures of. If you’re taking a picture of a person with the sun behind them, normally the person’s face will show up dark. By using the touch focus and touching the face, the iPhone will adjust to the face. This is my first experience with GPS in a phone. Google Maps work great, but what intrigues me more are applications that use location services. I tried using Loopt with a couple of my friends and I think it’s really creepy. The program allows you to see the location of your friends who sign up with Loopt. I spent the whole day checking on my friends time to time seeing them go to the Original Pancake House to Ikea. When my friend was in the Original Pancake House, it actually listed the restaurant as the location, not an intersection. I think the only use for this is for keeping track of family members. My iPhone 3GS arrived by FedEx and now I’m waiting for AT&T to activate my phone. The screen says that it may take some time. In the meantime in the tradition of Apple fans worldwide, here’s the unboxing of my iPhone 3GS. The screen of the iPhone 3GS is a lot warmer (more yellow) than my first generation iPhone. I like the colder blue of the original better. Surfing the web in Safari is a lot faster. I’ve tested it on WIFI but not yet on 3G. Setting up the phone with AT&T took only a few minutes in iTunes but took about 15 minutes for AT&T to recognize the iPhone 3GS. The old iPhone still works completely but now shows “No Service” in the menu bar. It’s essentially now an 8 Gig iPod Touch. You can still access the AppStore and download applications over WIFI. Also, you don’t have to worry about transferring your applications to the new iPhone. You can re-download applications from the Apple Store for free. The “Find my iPhone” function of MobileMe didn’t work for me. Got this error message saying that it couldn’t find my phone. I tried sending myself a message from MobileMe, but that didn’t work either. The funny thing is that about 15 minutes after I sent it, my OLD iPhone started pinging me with my old message. We’ll have to see if it eventually figures it out and sends messages to my new iPhone. UPDATE: iTunes automatically set up my email addresses and servers but didn’t transfer the password to my MobileMe account. 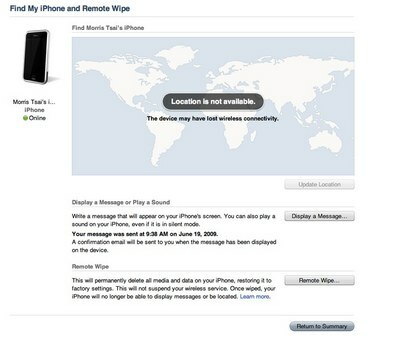 Once I entered the MobileMe password, the “Find my iPhone” function worked. The iPhone in the picture above is actually the original iPhone. Now, when I go to “Find my iPhone” it shows two iPhones, the original and the new 3GS. Amazing high speed camera movie. I think I can watch Jello bounce all day.